What can I do to stop these habits! I fear I'm going to get caught and get in heaps of trouble but I just can't stop! You WILL get caught, make no mistake! If you're a cleptomanic, then you need to go get help for that! You are passing on the price of this to the consumers, that can't afford to pay for your free stuff. Think of that next time you want to steal. Think of a single mother that can barely make it by, but is upholding the law while her baby goes hungry, while you and others are out there wanting a free ride. Prices go up, and it costs the rest of us! So think of the little baby that you may be taking the food from his mouth. If that alone doesn't make you stop, then I don't know what would! People aren't addicted to stealing. They just think THEY'RE entitled to the property instead of the owner. Maybe when a store owner hits you over the head with a baseball bat, that might stop you... Or maybe when they catch you and put you in the cell with Bubba, and he takes a little pleasure out of your rear end, that might stop you... Or maybe you want Bubba. I don't know. Could be. Yes, you merely want to do these things and perfer to consider your own desires over the rights of others. It is a matter of having concern over others and just not doing it. You can choose not to hang out with these so-called friends! True "friends" want the best for you, and want you to succeed in life, they don't want to drag you down and introduce you to a life of crime. And, you call these kids your friends? You have control of your own destiny my dear. This is a no brainer my dear! Stop doing what you're doing. Stop hangin with the crowd you are hangin with, and do good things for people, instead of bad. Kindness will be re-payed 10 fold, ignorance and crime will bite you in the A$$, and you WILL wind up behind bars eventually. You don't get the point here! It doesn't matter if it's $2, or $2 million, it is still theft, and the places you steal from, need to have insurance against shoplifters. The cost of this insurance is then passed on to the consumer... simple! It's the same with tagging! It doesn't matter if it's a gov't building, or your neighborhood store! It is still taken out of our pockets in the form of taxes, to clean up your mess, so we, and our children can live in a clean community! So do you understand now? So you asked your question why? Were you waiting for someone to tell you that they thought it was perfectly fine to do what you were doing? Find a hobby... other than tagging and theiving! Also Jackie D, I realise that you are just trying to fit in, and impress your friends. You are 12 yrs old, and you don't want to go into your teen yrs being a convicted criminal honey. There are so many other things ahead of you. You don't have to prove yourself, by stealing and tagging to make friends. Stay away from the group of friends that are doing this. I have a step son that has gotten into major trouble, because of the group of kids he was hangin with. He is now facing a prison sentence, and he is scared. He knew better, but didn't listen when I told him he was going to land in a jail cell with Bubba as a cell mate! Sorry doesn't cut it when you are sitting face to face with a judge. Don't take anything that anybody gives you. You never know what it could be, or how you will react if you take it. Don't get involved in drugs or alcohol just to fit in. That is exactly what my stepson did, and eventually got into a gang. He is living in the UK, and I just talked to him yesterday, and because of the gang he was hanging with, and because of a girl, he just heard from his lawyer that he might get 5 yrs in prison. It will affect the rest of his life! He will be limited with jobs he applys for when he gets out, people will not trust him, his group of friends will have moved on to different things, and he will find it hard to fit back in to society. Try to look ahead of the consequences of things that could happen, like your encounter with the group of 15 yr olds. Someone could have gotten seriously injured, or even killed! That is not so far fetched. There are all sorts of repercussions that you may face if you keep hanging out with the same group, and keep tagging and stealing, honey! I understand it would be, but you need to think about yourself and your life! You can't just run with the crowd and let them decide you're your future. You are in control of your own future, not them. You can probably even help them by telling them that you are going to back away, not because you don't like them, care about them, but because you want a better life for yourself. Tell them that your Mom or Dad forbid you to hang out with them... whatever you need to tell them. They are probably just going with the crowd too. BUT, you can be the bigger man, and they might just even follow your lead, in doing the same. You might not even have to give them up entirely! Just let them know that you are not going to put your life or well being in jeopardy anymore, just to be part of the group. This doesn't necessarily mean that you have to lose entire contact with them, just that you care enough about yourself, and your personal safety, to walk away from something that could affect your entire future. But I'm not stealing or tagging to be part of the group.. Ive had a bad childhood and my friend got me onto heavy metal music, mettallica, pantera, megadeth, trivium, and stuff like that ;O it kindsa soothes it and the greatest thrill I get is poppin up dARe on a wall and listening to "Walk" - Pantera.. I'm sorry that you've had a bad childhood. Why do you get such a thrill out of taggin "daRe" on other peoples' property? What is your payoff, other than a thrill? I might understand if you were tagging to be artistic, or to get a certain message across, but why daRe? Are you trying to antagonize others? or just doing it for the thrill of getting away with it? You sound very angry. I have never heard "Walk" by Pantera. I know a few Megadeath, Pantera, and Mettalica songs (Trivium I don't know), and if you like Metal, that's fine. But you can listen to that without destroying other people's property, and making them pay for your thrill. Why don't you get into art or something, while listening to the music you like, and do it on canvas, or on paper, instead of just a word that doesn't mean much?! What are you daring someone to do? Anybody can make excuses and be in denial for what they do. I am not stealing I really needed a comb. I am not lying I am just trying to not hurt your feelings. I am not defacing property I am just tagging. You need to face up to what you are really doing and the consequences. In my city some of the graffiti artists have made a REAL profession out of it. 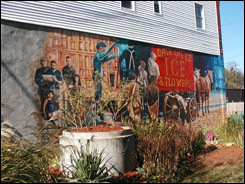 Try going to your city/municipal building with some sketches and some ideas on painting murals. Then if they like your idea and approve it you could paint legit murals. My daughter helped paint this one. My city has been doing a lot of murals.